"I've been drifting for so long, I don't even remember where I want to go…" This might hit a little close to home for any up-and-coming filmmakers out there who have done this kind of work and felt this way. Sundowners is an indie comedy about two struggling videographers who decide to take a job filming a wedding down in Mexico. But, of course, they run into all kinds of problems after they discover their boss is playing fast and loose. The main cast includes Phil Hanley, Luke Lalonde, Tim Heidecker, Cara Gee, Nick Flanagan, Chris Locke, James Hartnett, and Leah Fay Goldstein. This looks amusing, and a bit depressing, but maybe it's surprisingly quite good. There's some impressive match cuts and sleek editing in this trailer. Perhaps it's some kind of indie gem just waiting to be discovered. Who knows? Take a look. It's not the destination wedding that matters, but the journey the hapless videographers have trying to capture it. 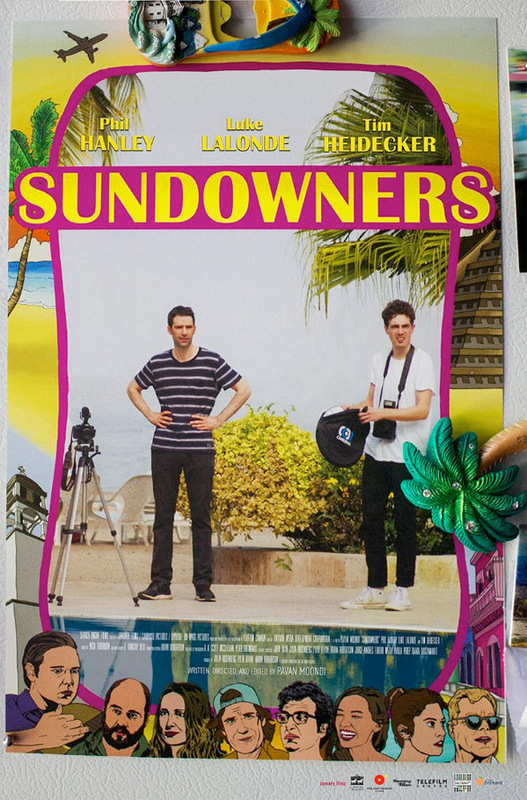 Sundowners tells the story of a struggling filmmaker who goes to Mexico to shoot a destination wedding, scamming his boss into thinking his best friend is a photographer in the process. Sundowners is both written and directed by Canadian filmmaker Pavan Moondi, of the films Everyday Is Like Sunday and Diamond Tongues previously, as well as a few short films and episodes of "Four in the Morning". This first premiered at the Nashville Film Festival earlier this spring, and also played at the Buenos Aires Festival of Independent Cinema. The film is set to play a few more festivals and open this fall in Canada, but still doesn't have an official US release date. For more info, follow @sundownersmovie. Anyone interested?